follow is a common feature (and often UI button) in silo UIs (like Twitter) that adds updates from that profile (typically a person) to the stream shown in an integrated reader, and sometimes creates a follow post either in the follower's stream ("… followed …" or "… is following …") thus visible to their followers, and/or in the notifications of the user being followed ("… followed you"). The biggest difference between following and friending is that to follow does not require an agreement between both parties where as friending does. Following is an asymmetrical relationship, where as friending is symmetrical. Another key difference is that friending typically implies many more permissions between the parties, e.g. in Facebook the ability to write posts on each others's "walls". Explicit follow posts can serve as a useful historical bookmark of when a particular online relationship began. A feed of follow posts could potentially be parsed to create a master following list (similar to an OPML file) that could potentially be used as input into one or more readers to provide better data portability instead of recreating lists when moving from one to another. Some will make explicit follow posts as an external indicator that they find a particular person/thing/account interesting and/or useful. In the early days of Twitter this morphed into the idea of a "Follow Friday" where people would make posts of accounts they followed and recommended on the service along with the hashtag #followfriday or sometimes #ff for short. These posts, while not specifically posted contemporaneously with the actual follow, were traditionally meant as recommendations to their followers of other interesting accounts worthy of following. These, like Twitter lists, were subtle reincarnations of the blogroll. Chris Aldrich has begun to actively create follow posts on 2/16/18. He keeps a list at . They're tentatively marked up with either p- or u-follow-of. He also maintains a following page at  which has associated OPML feeds for use in subscribing in readers as described at the bottom of that page. He's documented some of the creation of this page using WordPress at . Some of his follow posts also have SubToMe buttons which allow visitors to relatively easily also follow those same pages/feeds--see for example: . 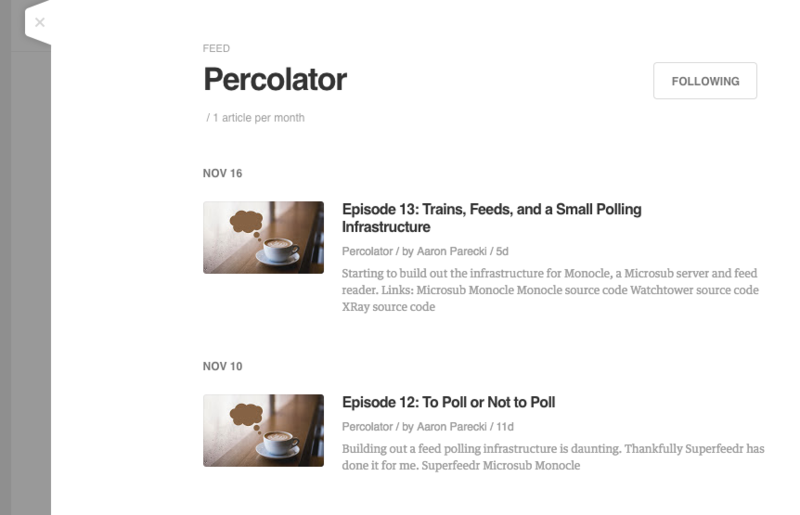 He also maintains a feed of follow posts which could potentially be parsed to create OPML files or similar functionality to port data to and from readers. He's considering marking up follow posts with XFN as well to use that data in the future. As of 2019-02-20 Chris created and maintains a Followers page on which he collects Webmentions and notifications of people who indicate they are following his website or who list him on their blogrolls. Eddie Hinkle created his first follow post on 11/25/2018. He started with creating follow posts for Mastodon users first because of two reasons. Mastodon users have only one feed, so the follow post is simpler to create (where as IndieWeb people might have several feeds I follow). Also Mastodon users don't have much visibility outside of Mastodon so in order for people to be aware of who I am and that I am following them, I needed to create a follow post to send to Bridgy Fed. He marks up follow posts by creating an h-entry with a u-follow-of attached to an h-card of the Mastodon user profile that I am following. If I want to include any explanatory content about why I am following that person I add it to the content. Eddie is thinking through how he wants to create follow posts for IndieWeb people where he follows multiple feeds (topics or type of posts). Amy Guy displays follows posts since 2015-04-27, see list at  (but they also show up mixed in with other post feeds). They were previously marked up with u-x-follow-of on the URL of the person/site followed, but as of 10/30/18 seem to be without such markup. I just added <a class="u-follow-of" href="$url">$title</a> by <a class="h-card" href="$url">$name</a> to my following page. As of 10/30/18 the u-follow-of markup seems to be gone. Subsequently broken during software changes and removed as this was the ONLY follow post created ever. When an ActivityPub (eg Mastodon) user follows a IndieWeb Bridgy Fed user, it translates that to u-follow-of #microformats2 & HTML and sends it to the IndieWeb user as a webmention. Likewise, when an IndieWeb user sends a u-follow-of webmention to an ActivityPub user via Bridgy Fed, it translates that and sends an ActivityPub Follow activity. Feedly uses the terminology "source" in the interface. You can add a new source to follow, and the prompt asks to "search by title, URL, or #topic". Entering a search term will return feeds that match the term. It is not obvious what is being searched, whether it is limited to blogs already being followed by someone, or if there is some other database being searched. If you enter a full feed URL, such as the JSON Feed URL below, that exact match will be the first result. Clicking on the feed name will pop open a modal dialog with a preview of the items in the feed. 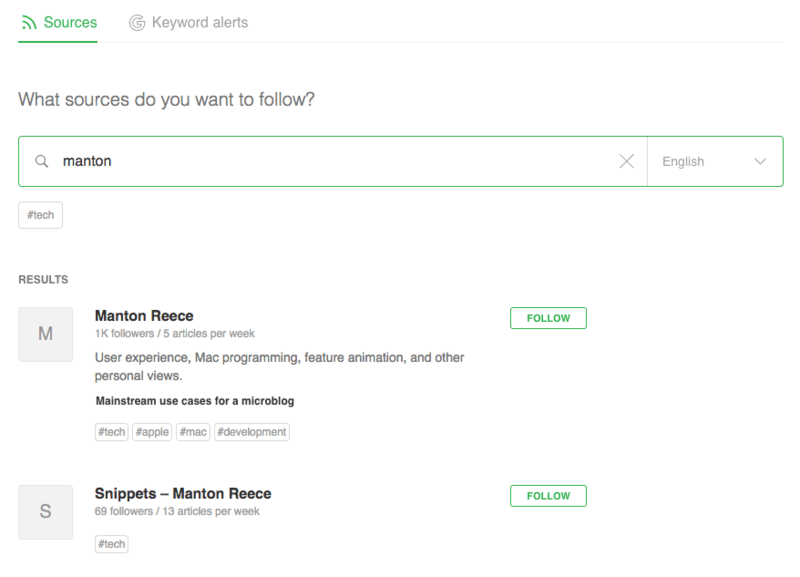 Clicking on the "follow" button will open a menu to select which of your "feeds" you want to add this source to. FeedHQ allows you to give a name to a feed, and you can choose which category it should appear under in the reader interface. FeedHQ requires that you enter the full feed URL when subscribing. If the feed URL is valid, you will be subscribed immediately. If you enter a URL that is not a recognized feed format, it shows an error after submitting. "When you add someone as a friend, you automatically follow that person, and they automatically follow you. This means you may see each other's posts in News Feed. When you follow someone who you're not friends with, you'll see posts that they've shared publicly in your News Feed." - Facebook help. As a result, you can follow people you're not friends with who have allowed this in their privacy settings, and you can unfollow people you are friends with, so their content doesn't appear in your timeline, without unfriending them. Facebook periodically shows new friend connections in the main feed, and so far as I can tell up-to-the-minute new friend information in the right sidebar. It also has 'suggested follows/friends' (link/page/screenshot?) and the ability to suggest a friend to someone. Algorithmic filtering - you likely will not see all the posts of everyone you are following (note the "you may see each other's posts" - may not will). Facebook has an algorithm they use to show you only posts that they think you'll want to see from those you are following. If you view someone's profile who is following you, the "Follow" button says "Follow Back"
Twitter pushes notifications to mobile apps when several people I follow all follow the same person and intersperses 'so-and-so followed blah' posts amongst tweets in a person's main timeline. There was an in-depth discussion in the chat about the difference between following people and following feeds and the differences between RSS and Social Media in that way. Conversation starts here and ends here. Eddie Hinkle pointed out a challenge with following IndieWeb users with potentially multiple feeds rather than a Twitter or Mastodon user which has a single user profile and feed at the same url. I created my first follow post (which was actually for a Mastodon user via Bridgy Fed). It worked well because I was able to do a u-follow-of with an h-card where the url of the h-card pointed to the Mastodon users profile. I think the part I'm stuck on is when I am following a person's feed that is not on their profile. I still want my follow post to be their h-card. But I think I also want to include the url of the feeds I am following. Marking them up as u-url is wrong because its not about identity, but rel=feed wouldn't be restricted to the h-card. I think we might need a proposed mf2 h-card property that denotes a feed url of some sort. Why create/publish "follow" posts that say 'A followed B' (or 'A unfollowed B'). Amy Guy: As the community is currently small, I'm interested in seeing when people I follow follow someone new, in case I want to follow them as well. This might not work so well if I was following hundreds of people (silos curate this information for you for a reason..). I'd potentially be more interested in choosing whose follows I see myself (eg. by subscribing to a specific 'follows' feed by someone). I'm not sure about posts for unfollows. Broadcasting unfollows could be rude/offensive/upsetting but if you unfollow someone for a specific reason (they are abusive, hostile, boring) it might be useful for me to know you've done this (and why). I'm definitely interested in keeping track of when I follow/unfollow people and creating follow/unfollow posts with published dates seems like a good way to do this. Could also add a note about why I (un)followed them (lots of people I follow on Twitter are consistently interesting but I can't remember when/how I found them). If I follow someone then unfollow them later, I don't necessarily want the fact I ever followed them in the first place to be lost to the ether. Every silo gives you the option to be notified when someone follows you. Is anyone sending/expecting webmentions for this? Following can be considered synonymous with subscribing, for example via a reader to consume content from a website or feed. This makes sense on platforms where each person has only one feed (eg. Twitter). However it's worth noting that one person or site can have multiple feeds (different types of content, different topics etc) so it might be useful to differentiate between following a person and subscribing to a feed. Performing a follow action on all platforms is a one time action done by clicking a button or entering your email address in a field and then clicking a button. If one is no longer interested in receiving updates from a source, they must perform an unfollow which is another manual action. There is the idea of a temporary follow, which is like a normal follow, but a temporary follow automatically expires after a certain amount of time or other condition is met. The first example starts to border on the territory of notifications in providing simple UI feedback to a user! "Follow" buttons are a popular and reasonably well understood convention in various service UIs (screenshots needed in examples above), thus it makes sense to develop an indieweb equivalent (beyond the existing "Subscribe" links/buttons). As a webaction, you don't necessarily want to subscribe to the page you are on - for example twitter supports follow on any user in the visible thread - the indie equivalent to this would be adding follow buttons to author urls in replies, comments and other webmention presentations. Twitter has a follow button that you can place on your own website and thus acts as a Twitter-specific follow webaction. On several silos follower counts are seen as important feedback on one’s work as well as a way of showing potential employers and advertisers that people like the content you are putting out there. The number of subscribers on YouTube is one such metric. This means following out-of-band, e.g. through the use of feed readers, is taking away important feedback from content creators. Martijn van der Ven makes sure to subscribe to YouTube channels on the site and uses YouTube’s OPML exporter to keep his feed reader in sync with subscriptions. Peter Molnar is switching from stalking RSS feeds to following people within silos - photographers on Flickr, 500px, etc, for example, so they get feedback on the number of their followers. This was always a problem with RSS (or any similar feed), even though services like Feedburner and embedded analytics (both JS and via tracking images) were trying to mitigate it, they never really worked well. The article "The Follower Factory" in the New York Times 2018-01-27 has a cautionary tale about bot following factories that could inform the value of following as feedback. How can we build to prevent this type of gaming so that the feedback has some actual value? <a class="u-author" href="/">I</a> started following <a class="u-follow-of h-card" href="http://tantek.com/">Tantek</a>. Extended brainstorming/thought session in chat that might be useful with respect to the idea of following/discovery. This page was last edited on 20 February 2019, at 22:48.